Since 2010, Laos Solidarity (registered in France under the name of Eau Laos Solidarité – ELS) has been helping the children of Laos improve their wellbeing. We began by building toilets and hand washing stations, setting up hygiene clubs to ensure key hygiene practices in northern Laos schools and communities. Teachers asked us to address the lack of knowledge and understanding of puberty and menstrual health, so we started the Laos Girls Teen Project in partnership with Luang Prabang library. Why? To empower girls and women of Laos to take ownership of their own wellbeing. “Six years ago I was teaching in a rural classroom near Kuang Si waterfall, when a 15-year-old girl called Vone told me she believed that she had cancer. For 2 years, she lived in fear of death. Equally frightening was the fear that somebody would discover her shameful secret. Every few weeks she went out at sundown with a hoe and the incriminating evidence hidden in her shiny handbag. After digging a hole under a tree, she removed sheets of blood-stained paper from her bag and rammed them into the hole, quickly covering them up with the hoe, scuffing the earth and hiding it with huge, dead leaves from the teak trees. She then crept back to the bamboo hut she lived in while at school, hoping nobody had noticed. At that time, most of the other girls were washing down at the river, and nobody asked her why she snuck away to the forest with her handbag and a hoe. What was Vone’s terrible secret? You may find it hard to believe that no one from Vone’s family, school or peer group thought to tell her that part of growing up was to start menstruating. But in 2012, in northern Laos there was no information for girls like Vone. There were no books about puberty and periods. It was a secret! For 14-year-old girls like Vone, shy, with an illiterate mother, there was no information available, even at school. Only in year 4, when she would be 17, would she have a biology lesson about reproductive health. But girls as young as 15 were becoming mothers. Rural mothers had no idea where periods came form, and like many communities in Laos they did not talk about their bodies. So they did not tell their daughters this was going to happen. In a baseline study in collaboration with the Luang Prabang Library Outreach team and rural school girls, we found that only 3% knew that they were going to menstruate. 3%! Is it any surprise that 1 in 10 Laos girls will be mothers by the age of 15? We also found a shocking level of poor hygiene practices. 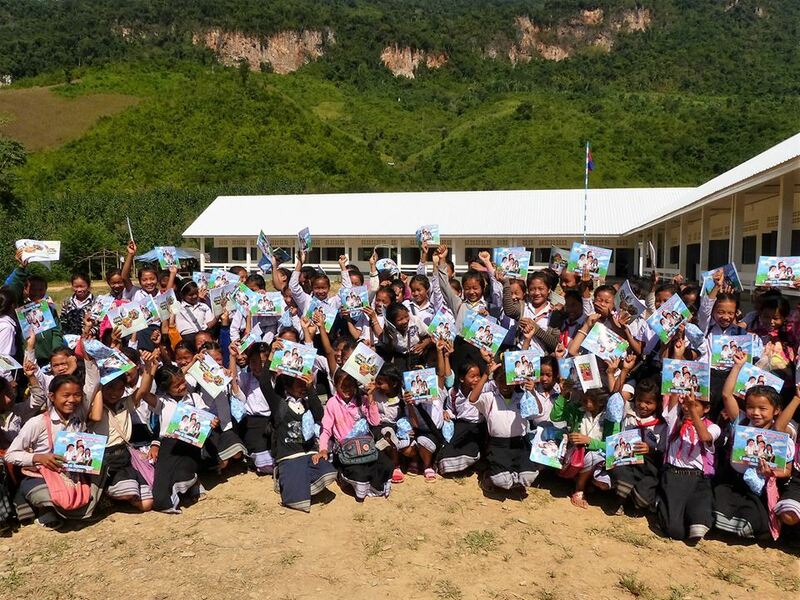 To help combat both issues we wrote and published books – no easy task in Laos where government approval is required for – and today we have reached over 10,000 rural school girls with this vital information about growing up and how girls can care for themselves and continue with their studies. “Later that same day we passed a large group of girls walking home, all reading the girls’ book, “I am a teenager”. For most of them, this was the first book that they had ever owned. This book will be shared with mothers, sisters, cousins, friends. In many cases, those teenage girls will become the authority on all matters menstrual. Since that day, we have distributed 15 000 books called “I am a Teenager” and provided over 19 000 hygiene kits of pads, underwear, soap and wash bags to schoolgirls and women in remote villages. If we can help girls like Vone feel normal, manage menstruation at school, and grow in confidence as a woman, we will have done what we set out to do. Knowledge really does empower.